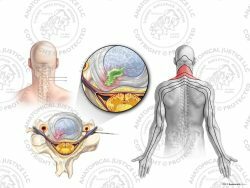 This exhibit depicts the axial and sagittal conditions of the cervical spine with subsequent anterior interbody fusion. 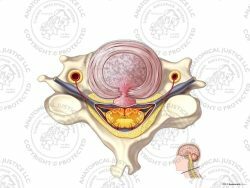 The axial pre-op image of C5-6 shows severe anterior bone spurs with uncinate facet hypertrophy impinging the neural foramina. 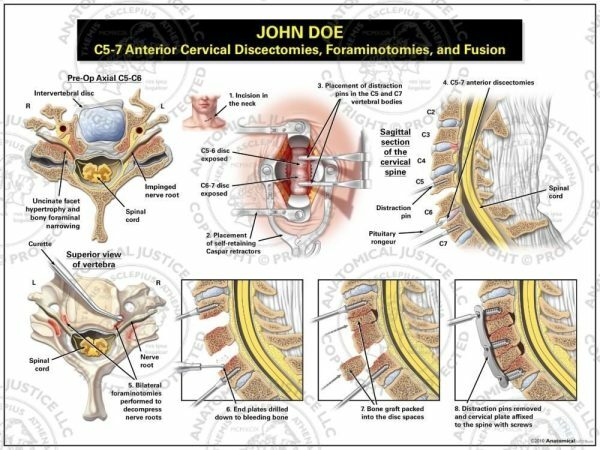 Sagittally, a disc herniation is seen at C3-4, bony hypertrophy is present at C5-7, and there is a disc bulge at C6-7. The procedure begins with an incision over the anterior neck, exposure of C5-7, and placement of distraction pins. Discectomies are performed at C5-7 and bilateral foraminotomies decompress the nerve roots. The vertebral endplates are then drilled down to bleeding bone, and bone graft is packed into the disc spaces. Lastly, the distraction pins are removed, and an anterior cervical plate is secured.